In the last months small Central Asian republic was attracting the world attention due to political turmoil and ethnic riots. At the same time, the riots were accepted as the continuation of post-Soviet political struggle or centuries-old ethnic conflicts. Nonetheless, it is worth paying more attention to this region (and Ferghana valley in particular) in order to understand the complexity and dynamics of the recent events. Feruza is Uzbek. She has lived in Osh for many years. On June 10, the day when the riots started, Feruza was among those who managed to escape to Uzbekistan. She and her two kids headed to her mother, living in Uzbek part of Ferghana valley. Although most of refugees are already back home, Feruza preferred to wait a bit longer. Her husband returned to the apartment in Osh, being afraid that it could be expropriated by Kyrgyz. For Feruza and her family the ethnic differences meant only cultural differences. Her neighbors in the apartment building were Kyrgyz. The Kyrgyz friend helped her reach the border with Uzbekistan, safer place for her and children. Feruza’s aunt from Jalal-Abad remained in the refugee camp at the border with Uzbekistan. Although she did not know the reason of riots and was surprised by the scale of violence she immediately realized that Uzbeks were the target. After several days of horror, fear and grief she returned home in order to be able to vote at the referendum on June 27 and, therefore, legalize Kyrgyz government. She does not believe it was an ethnic conflict. They have been living together for long time: men attended same chaikhana (tea place) and mosque, women were helping each other about the house, their kids were playing together. Their ethnic individuality was additional cultural peculiarity. On June 10, Botyr, young Kyrgyz soldier, was on duty in Osh garrison when the group of young Kyrgyz broke in, demanding to provide guns. Some were strangers, some others were his relatives. It was unclear who these people were, but they took almost all weapons of local police. The soldiers were instructed not to oppose civilians; they simply observed how they got robbed. Due to mass distribution of weapons the conflict gained monstrous bloody dynamics. After overthrowing President Bakiev there was the vacuum of power in Kyrgyzstan. The interim government counted on referendum while the son of overthrown President Bakiev tried to organize turmoil in order to destabilize situation and prevent referendum. It also has to be mentioned that the only Uzbek, holding official position under Bakiev’s regime, was Kadyrzhan Batyrov. Several times Batyrov organized the protest demonstrations, demanding more rights for Uzbek minority. Some observers view the reason of the conflict in his last demonstration. The evident revenge action was burning Bakiev’s houses while Uzbeks became in charge of it. The local newspaper said that the son of Kurmanbek Bakiev used this case in order "mobilize people" against Uzbeks. What is the ethnic component in the conflict? The international media did not pay much attention to the conflict in Osh and Jalal-Abad that was viewed as "centuries-old ethnic conflict" with unclear political motivation. Was it really ethnic and historical? Throughout many centuries the Ferghana valley has been populated by both Turkic and Farsi speaking nations. During Stalin’s regime the major factor was ethnic identity. Under some doubtful process the ethnic identify of people was defined there; as a result, Ferghana valley was divided between three national republics. During Soviet era the major identification factor was the place of birth. Being the native of Bokhara, Osh and Jalal-Abad was more important than being Kyrgyz, Uzbek, Uigur or Tajik. Until Russian was the language of international communication the ethnic component was cultural, but not political phenomenon. The ethnic identity could be also considered as the evidence of belonging to certain economic segment – Uzbeks were famous traders in south Kyrgyzstan. Such division was not an obstacle for international marriages and cohabitation. The knowledge of at least 2-3 languages was common practice. Therefore, we see integrated community that has been living in this region for many centuries, producing the region-specific common cultural space. On the other hand, the cultivation of national identities in the political field may result in the clashes. The locals agree that ethnic component became one of the simplest factors of mobilization in addition to prejudices and rumors. This case was not the result of "centuries-old conflict", but the matter of political and criminal struggle between Batyrov and Maxim Bakiev, the son of overthrow Kyrgyz president. At the same time, another negative factor was the memories of 1990 when the local land and water conflict gained ethnic character. While the ethnic identity becomes more and more politicized the real problems in the region lose their spot in the agenda. High level of unemployment and lack of resources substantially prevent normal socialization of young people. Looking for job, the impulsive young men have to migrate to other regions of the republic or abroad. The gap between rich and poor continues to increase. All three republics must admit they face the youth bulge. Therefore, the "ethnic" conflicts may be considered as the problem of youth that is ready to commit crimes for the sake of money and access to resources. The migration of youth from Central Asia to Russia became unbelievable. The official statistics reported 350 000 migrants while unofficial figures are much higher. Perhaps, there is no single family, not having close relatives in Russia. However, the competition in Russian labor market has intensified dramatically; for many people migration is not real alternative any more. They want to find job or occupation, generating profits for their native countries. The resource conflict at the local level can be characterized by the bazaar in Jalal-Abad; you can find all types of goods from everywhere in the world and people from all over Central Asia. On the day, following the riots, the visitors were shocked with the sign "Death to Uzbeks". 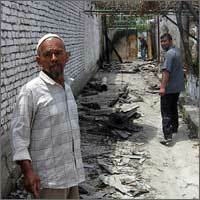 The bazaar was devastated; the spots, formerly owned by Uzbeks, are now occupied by Kyrgyz. In this case we see not only political power, land and water, but also access to jobs and resources. During pogroms the armed crowd was very selective in destruction and robbing. However, since there are no mono-ethnic districts in south Kyrgyzstan people had to declare their ethnic identity. Uzbeks escaped to Uzbekistan, Kyrgyz were moving to north and east. During the riots people had to re-adapt their ethnic identity to the circumstances. The rumors and stories played significant role in the conflict. They appeal to emotions and may serve as good instrument for mobilizing people. The validity of rumors does not matter. The rumors, saying that Uzbeks raped Kyrgyz girls, became the major story, flashing the violence. The story was accompanied with video report. It became the matter of honor for Kyrgyz and the conflict gained emotional aspect, clearly directed against Uzbeks. Kyrgyz boys (some were 14 years old) decided to revenge. Other evidences indicate that similar videos were disseminated in Uzbek side. Obviously, in addition to political, personal, criminal, economic and demographic tensions the appeal to the honor of young men sparked the clashes. Many people in Kyrgyzstan do not know how to react on violence. They do not want to admit this became possible in Kyrgyzstan, once considered as "island of democracy" in Central Asia. Many believe in democracy, peaceful state and see the reason in the political, externally brought conflict, organized by former President Bakiev, currently residing in Belarus in exile, or transnational religious movements. The fact that soldiers did not protect civilians, while some of them participated in the pogroms, is supersensitively accepted by Uzbeks. Many Uzbeks have no belief in law-based state; some others do not believe they will be able to live in peace with Kyrgyz. Does it mean the end of centuries-old coexistence of multi-ethic community? "Ethnic" track goes back to international organizations that have been attempting to prevent ethnic conflicts since 1990. The admission of "ethnic" background of that conflict attracted millions of Euro in the form of aid. Although there are enough ethnic reasons, the source of the conflict is democratic and economic condition, but not ethnic identity. While the ethnic approach is successful in the international level, the ethnic conflict will continue to happen. The ethnic factor will remain easily mobilized until we keep ignoring the fact that most of Kyrgyz citizens do not associate themselves with criminals and want to build democratic state, until Uzbeks get real aid and safety from state and until demographic and economic situation is ignored. Uzbeks were urged to come back in order to legalize the new government in Kyrgyzstan at the referendum on June 27. Most of Uzbeks came back because they are also interested in the stability. Despite many fears both sides are full of hopes and want to jointly build the future. The hope for peaceful future exists, but many problems are still a challenge.